The rapidly developing Bartók Béla út (a road starting at Gellért Sqr. in the Buda side, in district XI. ), hosts the Eleven Spring Weekend on 18. and 19. May 2018. The name is a word game on the district number XI. and the Hungarian meaning of eleven: energetic, lively. The programs of the 3-day festival will be themed around Portugal: its culture and gastronomy. Bartók Béla út – cafes, art galleries, shops, bars. Szent Gellért tér (the square in front of the Gellért Baths and Hotel). Feneketlen tó (a small lake and park near Móricz Zsigmond körtér) and surrounding area. Gárdonyi Square – a small plaza with the statue of Géza Gárdonyi novelist in the centre. We will publish the 2018 programs as soon it is available. Opening Ceremony– The event opens on Friday, 06. 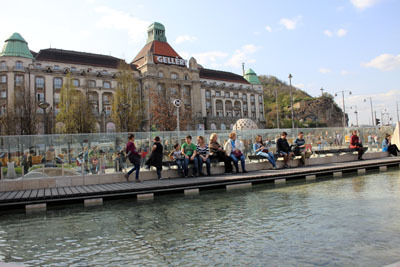 May at 16.00 on Gellért Square in front of the M4 Metro Station with an outdoor concert and exhibition. Miénk a Tér – We Own the Square, Gárdonyi tér, Saturday, 23. Apr., 10.30-13.00 – a relaxed gathering of locals living in the area as well as everyone else who wants to partake in shaping the future of BBB, short for Bartók Béla Boulevard. Exchange some cakes, pastries and ideas and have fun with local people at Gárdonyi Square on Saturday . Guided walk along the Boulevard lead by Szilvia Péter – Saturday, 23. Apr., at 11.00: meeting at Gellért Sqr. Family programs in Pagony, a Garden Bistro opposite the Gellért Baths (at Kemenes utca 10. ): this cute outdoor cafe/restaurant hosts an interactive investigation of children stories and tales the result of which will be a story book installation. Chocolate weekend in Cafe Gottier (Bartók B. út 9.) – chocolate-themed movies, craft bonbon fair, chocolate workshop and tasting by the 9s Chocolatier. The Pagony Bookshop – specializing in children literature – will also host a couple of programs on Friday and Saturday. Palack Bor & Tapas Bar, Gellért tér 3., district XI. Bor és Kézműves Üzlet-Műhely-Galéria (Wine & Craft Shop-Gallery), bartók Béla út 8. You can find the detailed program of the event here (In Hungarian) or on Facebook.